(Southern Weekend) The Invasion of Underground Lottery. By Cao Yunwu (曹筠武). April 5, 2007. In 1999, an underground system for "Mark 6" lottery was detected in Chaoyang, Guangdong province. From there, this gambling activity quickly moved northwards and is threatening to spread everywhere. Over the past few years, the various local public security organizations have undertaken a series of clean-up activities. But the "Mark 6 lottery" gambling went underground and spread to most of the rural areas of China with the exception of Tibet. It has spread especially fast in the relatively impoverished western and northeastern regions of the country. What kind of environment allows underground "Mark 6 lottery" to survive? What are the unique characteristics of the process of spreading and the operational business models? What kind of influence and impact did it have on the locals? This is a special report from this newspaper following similar reports in 2002 and 2004. "If this is not controlled, it will sweep across the country." In March 2002, a local official told us in Guangdong province which had been swept by "Mark 6 lottery." 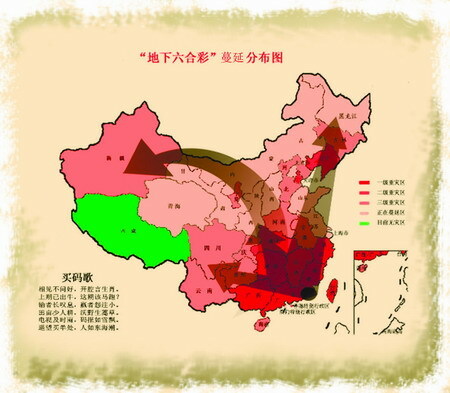 Five years later, our reporter followed the path of spreading of the underground "Mark 6 lottery" and found that this "plague" has gone beyond the disaster areas of Guangdong, Guangxi and Fujian into Hunan, Hubei and Zhejiang, and now it is heading to the western and northeastern regions of the country. The underground "Mark 6 lottery" is sweeping across the country. If he were still a middle-man, Wang Mingfu (a pseudonym) ought to be having his busiest moment. On March 21, Hunan province Yueyang city Yunxi district store owner Wang Mingfu sat in a teahouse and chatted with a few friends. "It is not a viable business anymore," sighed Wang Mingfu. "I lost money myself. Besides, the business is bad now." Around the Lunar New Year of 2004, Wang Mingfu got to know his higher connection through the introduction of a friend and became a middle-man. It was not hard to become a middle-man. He needed an introduction from a trusted acquaintance and put a deposit of 20,000 RMB. Then he was "in business." Wang Mingfu was a second-level middle-man. He found a dozen or so first-level middle-men who were in direct contact with the buyers, filled out the bets and collected the money. "I mobilized all my family members, relatives and friends," said Wang Mingfu. "My father helped me to fill out the betting sheets." A telephone, a fax machine and a computer were the sum total of Wang Mingfu's equipment. Before the winning number was announced, Wang Mingfu sat next to the telephone and recorded the bets from each bet filler. He used the computer to tally the bets on every number. Then he faxed the totals to his higher connection. Wang Mingfu's "business" was red-hot at one time and he had a dozen bet fillers. "Basically, everyone in Yueyang came to me. I was receiving 200,000 to 300,000 RMB in bets for each drawing." The higher connection gave Wang a commission of 10%. That is to say, he could earn between 20,000 to 30,000 RMB for each drawing. Furthermore, Wang Mingfu said that "he had an even better way of earning money." The most common method was to run an "average bet". For example, if the average bet per number was 1,000 RMB per number. Then he would take away 200 RMB for himself for a total of almost 10,000 RMB. If nobody won this time, then he kept the 10,000 RMB for himself. Even if someone won, he would only have to pay 8,000 RMB and still net 2,000 RMB. Apart from that, if the middle-man liked a certain set of numbers, he can always use the buyers' money to make his own bet; or if he knew that a certain set of numbers would not win, then he can withhold the bet for himself. "These are all 'high-risk, high-payoff' activities and the key is to be correct," said Wang Mingfu. "Otherwise, the result can be tragic." Compared to Yunnan and Guizhou, "Mark 6 lottery" entered Hunan even earlier. Our reporter found that the underground "Mark 6 lottery" went west to Yunnan and Guizhou through Hunan. According to Wang Mingfu's recollection, someone in Pingjiang county Yueyang city began buying numbers in 2003, and then it spread to the surrounding areas of Yueyang, Chenzhou, Ludi and eventually all of Hunan. From Yueyang, it went north into Hubei province. After a red-hot year or so, Wang Mingfu's business began to go downhill in 2005. The players were losing more and more money. Some people have nothing left and began to owe money. "Basically, I could not collect any money." Wang Mingfu's friend Xu Xia (pseudonym) knew what the reason was. "Everybody lost everything," said Xu Xia. For the more than 2 years between 2004 and the end of 2005, she lost almost 300,000 RMB. Xu Xia and her husband worked at the power station and they were reasonably well off. After losing all her family savings, she finally decided to quit. "If I continued, I would pile up debt." Xu Xia recalled that 2004 was the hottest year. A group of sore numbers losers even went for a silent sit-in in front of the municipal government office to ask the officials to tell them the "special numbers" to play. A roadside rumor said that "in order to strike at the lottery game, the city government had assembled a team of experts to decode the lottery numbers." The government officials did not know whether to laugh or cry. After giving some explanations, they managed to persuade the crowd to disperse. In 2006, Wang Mingfu suffered an even greater setback. After the numbers came out in a drawing, his higher connection vanished with all the money. The winning lottery players surrounded Wang and threatened his life. So Wang Mingfu had to take out several hundred RMB of his own to pay them. "I lost everything that I made previously." During an anti-lottery sweep in Yunxi around the Lunar New Year, Wang Mingfu's father was arrested. "The poor old man spent the Lunar New Year in a detention cell." After getting his father out of the detention center, Wang Mingfu decided to quit. So now Wang Mingfu and Xu Xia are out of the business. But they still pay attention to the trends in the winning number. On March 21, at the teahouse, Wang Mingfu was asking for information from his "friends of the trade." "This drawing is red-hot." He said that many people will be disappointed because the dealers know the trend and will not accept certain bets. In fact, betting on this drawing may be closed prematurely. "This kind of red-hot scene has not been seen in a while," Wang Mingfu recalled. "When 'Mark 6 lottery' was really hot, the entertainment/food street in Yueyang was especially flourishing. At the time, someone joked that 'Mark 6 lottery' made the entertainment/food street." But if you go down to the entertainment/food street today, you do not see many diners. The whole street is empty and devoid of activity. "Nowadays, nobody has money. How can they entertain themselves?" signed the owner of a music bar. "Mark 6 lottery" was like a leech that sucked the blood out of the local economy. According to a 2003 survey in Yueyang city, Hunan province, the ten survey locations showed that more than 1 million bets were placed in the underground "Mark 6 lottery," and the participants included workers, teachers, cadres and (most of all) farmers. Each bet was worth 5 RMB, 10 RMB, 100 RMB or even 10,000 RMB. In Pingjiang county, more than 400,000 persons in 11 towns participated in the local underground "Mark 6 lottery" while spending more than 20 million RMB of hard-earned money. On April 3, 2003 alone, villagers took out more than 320,000 RMB from the Hongqiao town credit union. The next day, the money went to Guangdong, thus causing the first "financial crisis" in town history. In 2003 alone, 300 to 400 million RMB flowed out of Yueyang city. "'Mark 6 lottery' has basically reached its limits in Hunan," said Wang Mingfu. "All the money available for taking has been taken. I asked the people in the trade and they said that the center is moving westwards." Play "odd" or "even"? This is the question that 18-year-old third-year high school student Gu Yungui (pseudonym) of Zhenxiong town Yunnan province is contemplating hard about. Right before the Hong Kong Jockey Club announced the special number in the 35th drawing of 2007 at 8:30pm on the evening of March 22, countless number of mainland numbers players like Gu Yungui were racking their brains to make their choice. Even since the number "20" came out on the 29th drawing, even numbers have won six times in a row. The numbers range from 1 to 49; there are three drawings each week; one special number wins each time. The players can play any number; they can play odd/even. The dealer has also divided the 49 numbers into red, blue and green, as well as the twelve animals. The buyer can buy by color or animal. There is no bet limit. A winning number pays 1-to-40. "I want to reverse my entire fortune with this one bet." On March 20, Gu Yungui sat on the side of the bed in the dark rental room as his eyes gleamed. "Even numbers have appeared six time in a row. It could be an odd number this time." Since playing "Mark 6 lottery" at the end of 2005, middle-school student Gu Yungui has lost all his tuition fees and living expenses. He has borrowed money from almost every one of his relatives and friends. He still owes the dealer several tens of thousands. "I lost almost 60,000 RMB in total." When he placed his first "Mark 6 lottery" bet, Gu Yungui was in the first year of high school. He remembered the size of his bet: 10 RMB. In a flash, "Mark 6 lottery" entered the lives of the people of Zhenxiong town from neighboring Guizhou province. "You can hear people discussing the special number everywhere. Everyone in the village played," said Gu Yungui. "One RMB can win 40 RMB!" In explaining the rules to Gu Yungui, a fellow student who had won previously told him. He gave Gu Yungui the telephone number of a middle-man and told him that he can also play through the middle-man. When betting on "Mark 6 lottery," the buyer cannot make contact with the dealer. The number selection, the betting and the collecting of the winnings have to go through the middle-man who works for the dealer. Numerous middle-men form a broad sales network while the dealer hides behind the scene. The middle-man introduced to Gu Yungui by the fellow student was the owner of a small store. The students went there often to buy things, and the owner has assumed the part-time job of selling "Mark 6 lottery." These types of middle-men rose up like blooming flowers after the rain in Zhenxiong town three years ago. Gu Yungui used his allowance spending for one day to place his first bet. He studied the secret sheet given to him by his fellow mate. It was a thin A4-sheet with certain obscure lines of poetry and profound combinations of numbers printed on both sides. Gu Yungui pondered these like a mathematical problem and exchanged ideas with his fellow students. Then he chose one number. While waiting for the announcement of the winning number, Gu Yungui heard stories of sudden riches from his fellow student. A certain villager dreamed about a number one night and then he bet his entire assets on that number. The villager wounded up hitting a winner and became immensely wealthy. "You bet 100 RMB and you can make 4,000 RMB. You bet 1,000 RMB and you can make 40,000 RMB," said Gu Yungui. "Who wouldn't want to try it? My living allowance is just 200 RMB per month. If I win once, I would solve my problems for years to come." During the two days before the number was announced, Gu Yungui did not think about what he would do with the winnings. Although that first 10 RMB went down, it aroused Gu Yungui's resolution to study the art of lottery betting. His first win came soon. Not long afterwards, Gu Yungui won an animal. Each animal has 4 numbers. By betting 100 on each number, he won more than 3,000 RMB after deducting the 400 RMB in cost. At the restaurant outside the school, Gu Yungui ordered a table of food for a dozen of his fellow students. To the praise of his fellow students, Gu Yungui thought that he had discovered his path to success. From there on, he began to place bigger and bigger bets. But he "lost more than he won." In March and April last year, Gu Yungui kept betting on "odd" and he lost more than 9,000 RMB in just over a week. Previous to this, Gu Yungui was considered by the teachers to be a smart child with his marks were usually within the top ten of his class, especially for chemistry. "My former dream was to become a chemist," said Gu Yungui. Actually, he has not been studying since second year of high school. He has given up his dream to be a chemist. He invested the tuition fees sent by his parents on "Mark 6 lottery," including the 2,000 RMB that his father gave him in order to get a driver's license. He borrowed money from several relatives and he owes the dealer almost 20,000 RMB. Just after the Lunar New Year, the child of a "Mark 6 lottery" debtor was abducted and hung from a pedestrian bridge in the middle of the county city until the debtor paid money. Gu Yungui walked past the scene by chance and witnessed the scene. He was terrified. "I owe so much money to them. What will they do to me?" So he quietly moved to this rented room and cut off all communication with his previous connections. He sleeps during the day and goes out at night. He does not dare return home. He occasionally calls his younger brother to say that he is alright. He is still interested in "Mark 6 lottery," but he does not have the money to bet with. But with six "even" numbers and 12 consecutive "blue" and "red" numbers, Gu Yungui sensed that the opportunity is here again. "It is highly likely to have an odd number and a green number. If I make the right bet, I can reverse my fortunes." But the problem was that with his debt and "disappearance," Gu Yungui has lost all credibility with his middle-man and dealer. Besides, he does not have any cash. He needed to find a middle-man who will trust him and give him advance credit to make a bet. The Sichuan-taste restaurant female owner Li Yun (pseudonym) has the same ideas as Gu Yungui. "Six even numbers in a row. If I start playing odd numbers from now on, I should be able to win something if I play the next two or three times." Li Yun's "method" is actually more like "lesson." She had been a big player. This restaurant was started just this year. Previous to running the restaurant, she operated a transport fleet. "I was a big player back then," recalled Li Yun. "I lost more often than I won, and I lost rapidly." Whenever the winning number was announced, Li Yun would sit in front of the computer and became nervous. "My hands and feet were cold, I was sweating all over my body. The waiting was unbearable." Once the number was announced, Li Yun began to calculate: "I just lost a van" or "I just lost a truck." By the time the transport fleet was reduced down to two trucks, Li Yun quit. She sold the trucks and rented the space for the restaurant. Business has been good. "I still play whenever the opportunity arises." This time, she is prepared to "spend 100 RMB per number; on 24 even numbers for a total of 2,400 RMB." "I better place the bet early," said Li Yun. "Many people are betting 'odd' this time. The dealer may be accepting any bets later." Gu Yungui and Li Yun are just two of the countless bettors in Zhenxiong and other towns. There is a popular doggerel in Zhenxiong town: "When you meet, you do not ask each other how things are; you talk about animals instead -- last time it was cow and this time it should be horse. The losers sigh while the winners regret not betting enough. The farm lands are fallow because nobody is working while the fertile earth is covered with weeds." According to a survey research conducted by a Zhenxiong middle school student, 92 out of 100 randomly selected students claimed to have played "Mark 6 lottery" and 94 claimed that some relative or friend is playing "Mark 6 lottery." In Zhenxiong and the neighboring Bijie (Guizhou province), "Mark 6 lottery" is proliferating. According to the <Report by the Bijie city public security bureau on the campaign against 'Mark 6 lottery' betting>, 26 villages in 6 towns in Bijie have seen "Mark 6 lottery"; in Qingchang town (Yunnan province) next to Zhenxiong town, there are 54 groups of villagers totaling more than 1,000 persons in nine villagers engaged in gambling. "We must defend Bijie, or else it will spread to all of Yunnan and Guizhou," said Bijie city public security bureau director Chen Xueyin to our reporter. "If you rear chickens and ducks, you will be poor forever. But you can reverse your fortunes with a special number," said Miaogeng village Yilei town Zhenxiong county villager Chen Changren when he was still alive. In February right after the Lunar New Year, 55-year-old Chen Changren swallowed a pack of rat poison and died instantly. This simple and honest rural farmer who hoped to "reverse his fortunes through a special number" left behind a debt of more than 70,000 RMB. In Miaogeng village, Chen Changren was not the only person who lost money on lottery. "You look at the fallow farmland by the hillside," said village cadre Zhu Shaohua angrily. "People have gone crazy. They don't farm the lands anymore. They don't feed the pigs. They are counting on buying the special number to reverse their fortunes." But Chen Changren and others have their plausible reasoning. "How much can you earn from farming?" In Miaogeng, a farmer calculated the numbers for himself: "Four mu of barren hillside land; 2,000 jin of maize per year; plus 1,000 jin of millet; no vegetables except potatoes can be grown, and they are only the size of a finger. Apart from feeding oneself, there is only enough for buying fertilizer. There is not enough to pay for pig feed." "We are too poor," said village cadre Zhu Shaohua. "That is why everybody dreams of sudden wealth." In the local villages, the best season for "Mark 6 lottery" is during the Lunar New Year. All the migrant laborers return home with their hard-earned money and many of them hope to become wealthy through playing the numbers. "Basically, everybody loses," said Zhu Shaohua. "Many people lose everything. Then they go back to earn another year's money after the Lunar New Year." In the rural villages outside Yunxi (Yueyang city Hunan province), the "Mark 6 lottery" has become the most important entertainment for villagers. It has even become a part of their lives. In Yunxi, there are nicely printed numbers books and newspapers for sale. Apart from the so-called "secret tips," there are some jokes, stories and general knowledge in these publications. The numbers players read these numbers books faithfully every day just like newspapers. Certain television programs have even become hits among numbers players. People in different places have different favorite programs. In Heilongjiang, they like "Daily Agricultural Lesson"; in Fujian, the numbers players analyze a certain cooking program; in Guangxi, the numbers players like the local <Southern Nation Early News>, which is a newspaper that sells for 0.5 RMB but has been selling at as much as 10 RMB "because it contained secret tips." "There was nothing much in the way of entertainment before. But now there is something to analyze. Objectively speaking, many people derived a great deal of entertainment." Middle school teacher Du Zhen (pseudonym) said that before the numbers were announced each time, everybody gather in the classroom of the village elementary school and hold a meeting which was exciting and friendly. "Some older people even said that this reminded them of the collective lives back then," said Du Zhen. "Presently the rural village is really like a box of loose sand particles. The old tradition is practically all gone and people rarely visit each other. But when 'Mark 6 lottery' came along, everybody is back together again." Li Xu is the person who started the "Mark 6 lottery" in Yueyang and he has some deep reflections . His grandfather was a numbers player but Li Xu did not want to stop his grandfather. "This is the only entertainment that he has," said Li Xu. "As the story said, the environmental protection volunteers see the mountain residents digging up the wild vegetables on the hillside for food. They know that the digging would destroy the environmental equilibirium, but they cannot bring themselves to stop the activity because they know that the vegetables are the only food for the mountain residents." After the "Mark 6 lottery" storm blew by, Hunan is in a post-disaster era while things are only getting started in Yunnan and Guizhou. Middle-school student Gu Yungui has obviously not give up hope yet. From March 20, he contacted several middle-men and asked for advanced credit to make a bet on "even." He was refused by all of them. One middle-man told him clearly: "We are not accepting any bets on 'even numbers' this time." Gu Yungui was wavering. He was considering whether to contact the middle-man that he knew, but he was afraid of trouble. After making a round of telephone calls, Gu Yungui became desperate. Every middle-man turned down his request for advanced credit to bet on "odd." He did not even have money to make telephone calls. More than half a year ago, he had a mobile telephone which was later given to a middle-man. The restaurant female owner Li Yun does not have that kind of problem. She still has a good reputation and she has enough money. She only needs to worry about the timing. "The betting for this drawing will be closed down early. I have to be quick," she said. Based upon past practice, betting is closed thirty minutes beforehand. But this is an "abnormal period," so Li Yun asked several middle-men and found out that betting would close one day ahead of time. On the evening of March 22, there did not seem to be anything unusual in the streets of Zhenxiong town. But if you went into any Internet cafe, you will find that everyone is looking at all sorts of "Mark 6 lottery" websites. At 8:30pm, the special number for the 35th drawing of 2007 was announced. As expected, the special number for the drawing was 49, which was a green ball. This was how the first "big incident" of the 2007 "Mark 6 lottery" ended. It is impossible to count how many people restored their fortunes and how many people lost everything. According to rumors, some dealers who had too many winning buyers have fled with the money. Such things have happened many times before, but these cannot be confirmed. According to the analysis of former dealer Wang Mingfu, "they have not fled, but rather they are setting up new battlefronts in the west." "There is no protection from the law. They change a place and they continue to make money." The only thing that does not change is that two days later, there will be a new drawing. Restaurant owner Li Yun earned a small sum. According to her description, this was only enough to buy one car wheel out of all that she had lost. Meanwhile, middle-school student Gu Yungui continued to hide in the dark and damp rented room and wait for the chance to reverse his fortunes that may never come. On March 23, the reporter received information from Gu Yungui: "You know the experts. Can you get me a special number? If I can recover my losses with one win, I will quit."